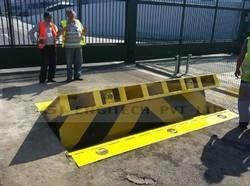 Our range of products include hydraulic road blocker and automatic road blocker. BGI's wedge roadblocks are the anti-ramming solution of choice for the highest security installations where full-width lane protection is required. With their quick deployment and ability to bring a vehicle to a complete halt, the Road Blocker is engineered to meet the most demanding security standards. The R-2000 Road Blocker is suitable for the protection of sensitive government and military locations and of entrance ways to key infrastructure compounds. With a shallow 53 cm foundation and an efficient hydraulic mechanism, the R-2000 Road Block is simple to install and operate and requires minimal maintenance. The roadblock can be activated using a range of access control solutions and can be fully integrated into perimeter security systems. From the day of commencement, we are engaged in bringing forth the clients a broad array of Automatic Road Blocker. Specifically designed to bring a speeding vehicle to a sudden halt without harming the passengers, the range serves as a perfect anti-ramming security solution. Designed to completely close an entrance line to a facility and bring vehicles to a rapid halt, BGI's Road Blocks are an ideal solution for sensitive installations around the world. The range is extremely suitable for locations requiring the high level of security such as sensitive government and military locations and entrances to construction sites, to name a few. Length can be customized.